Multi-talented architect and designer, she has made style and elegance her trademarks and energy and curiosity her buzzwords. She manages, as very few do, to move casually and with curiosity from product to fashion design, working in his studios in Milan and Paris.She graduated in Architecture from Milan Polytechnic and then started work as editor on the magazine Casabella and took part in the birth of Modo. She came to the world of design through experimentation with the avant-garde groups Alchimia and Memphis. 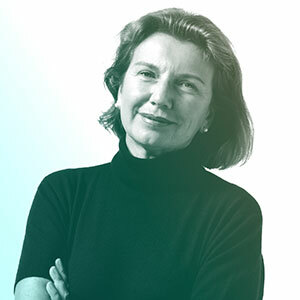 Since then she has never stopped, ranging from furniture, to lighting engineering and textile design.Hers is a longstanding partnership with FontanaArte, in the early eighties, under the artistic direction of Gae Aulenti, with Franco Raggi she designed the layouts for events starring the company. In 1992 she designed Prima Signora, a timelessly elegant floor lamp, for FontanaArte.She teaches courses at Milan Polytechnic and has worked with the Domus Academy since its creation.